Unicondylar knee arthroplasty (UKA) is far less common than total knee arthroplasty (TKA) due to the relatively narrow indications, the higher risk of revision compared with TKA, and surgeons’ lack of experience with (and in many cases, lack of interest in) the technique. Nevertheless, UKA is a viable alternative to TKA for patients with osteoarthritis (OA) in only 1 condyle and an intact anterior cruciate ligament, said Christopher A.F. Dodd, MB ChB, FRCS, during ICJR’s instruction course on joint replacement at the 9th Congress of the Chinese Academy of Orthopaedic Surgeons. UKA is a truly minimally invasive procedure, Dr. Dodd said, requiring only a small incision and a small component. 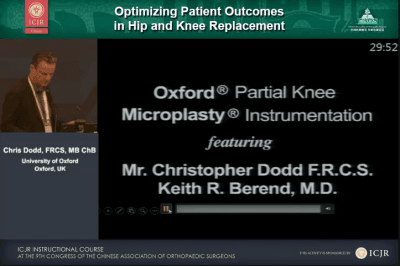 Dr. Dodd, from the University of Oxford in the UK, presented a video on UKA at the meeting, promoting the technique as a good option for the surgeons in attendance to offer their patients. He noted that Asian patients have a higher incidence of tibia vara than Western patients, which predisposes them to medial OA – a clear indication for UKA. In addition, he said, UKA is more likely than TKA to provide the greater range of motion these patients desire. Click the image above to watch Dr. Dodd’s presentation.